One of the easiest things to learn how to sew is the humble pillowcase. They can be as simple or as elaborate as the sewist can imagine. Many charities love to receive pillowcases (Conn-Kerr Cancer is one that I support) as donations in and of themselves. But, it is also a nice extra to make one or more pillowcases to match a quilt gift! Quilts of Valor presents their quilts to service members and veterans in a pillowcase. The quilt is folded neatly inside and it makes a lovely additional gift. Once in their respective cases, the quilts stack easily and are simple to transport in large numbers. They also make really nice gifts to give. If a child loves a certain superhero, cartoon character, or color scheme, a very lovely pillowcase can be made to those specifications that will make them happy. Teens also love to personalize their decor with camouflage, tractors, Nascar, sports teams, animal prints, funky retro patterns in fluorescent colors. You may already have scraps in your stash that would make a great pillowcase! If not, even Wal-Mart is bringing back fabrics in many areas and they cater to the trendy stuff. This type of project is quick and can be very frugally completed as well. Above is the detail of one of the pillowcases that I made for my parents to go with their Christmas quilt. It is made entirely from scraps from the quilt so they will match perfectly and add a bit of coordination and detail to their bed. The body of the case is from a mottled khaki print that is on the backing of the quilt. 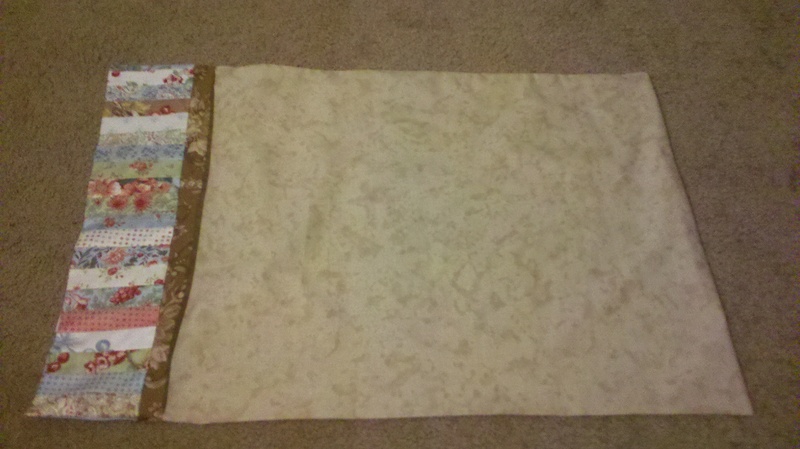 The brown detail is from the inner border of the quilt. The various strips are leftovers from the quilt body. Since I always buy a bit extra in case of mistakes, these were a simple addition to make. Try some pillowcases! They are fun and easy to make. For a good tutorial, check this one out.